3DS Emulator & Flash Cards for Nintendo 3DS Roms? Super Card team (the people behind SuperCard DSTWO and DSONEi among others) have been quoted as saying that they believe that their SC DStwo model is highly likely to be compatible and work on Nintendo 3DS despite the new anti-piracy measures that Nintendo has introduced. They are talking about the DS MODE on the 3DS in which You will be able to play nds roms and emulator on the new 3D consoles. Nintendo has promised to keep 3DS backward compatible with DS games and that is what the Flash Card makers are sure to exploit to get their cards working on the N3DS. It took Super Card team only a couple of days to crack the 2 DSi anti-piracy / backup device blocking firmware updates, and lets hope the same happens with 3DS copy protection. Now when we get to talking about 3DS rom Flash Cartridges that could be used to play commercial and homebrew 3DS ROMS - everything becomes more uncertain. All teams are sure to start hacking 3DS as soon as they get their hands on it, but it is likely that we will see 3DS R4 Flash Cards only when some of the game developers leak or share the SDK and DevKit details for the Nintendo 3DS. And it is highly unlikely that we will be able to play 3DS roms from a R4DS - good thing there is still time to save up cash for purchasing new 3DS adapter next year. UPDATE: Nintendo 3DS has been hacked and can play NDS roms in DS-MODE! Still if you need a blank cartridge for NDS ROMS on the old DS or DSi - you can buy one of the current DSTWO or R4 SDHC DS cards that will do the job just fine! List of fun things to while waiting for Your new Nintendo. the reason GTA:CW takes so much notice, isn't just because it was made smaller, but also because despite the hardware used Chinatown Wars captures the GTA feel almost perfectly. 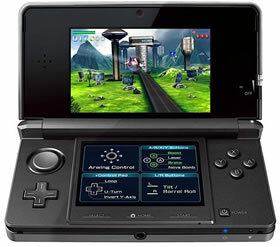 It can be seen that the Nintendo 3DS has actually gotten a boost when it comes to its graphics. Players will see that if they try to play the PS2 Game Metal Gear Solid 3, it really looked even more superior as compared to that of the original game in PS2. 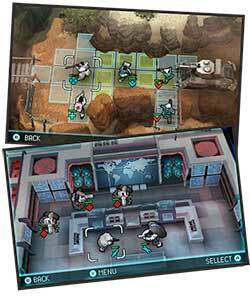 In terms of the graphics, it will definitely be far off than that of the PSP. You will see on the DS's outer casing the two lenses of the camera which are about two inches away from the other. Though it looks strange, this actually allows you to capture photos in 3D and this is indeed a very enticing feature. Though this may not be the one that you tried at a demo, you should expect these consoles to become available soon and allow you to edit photos and even record videos. What makes it more impressive is that the demonstration of augmented reality which showcased the Nintendo 3DS and recognized a sticker found on a table which was in front of the people, on the screen, was able to come up with the appearance of the 3D dragon. It would be possible for you to move the Nintendo 3DS around so that you may see the dragon regardless of what the angle may be and feel as if it was really there. You will also see that the console has its third camera located inside and would be able to take photos in 2D, but this can also be featured on the games. In the demo for the game Nintendogs+cats, you may have your head tilted and you will see that the puppy on the screen will also tilt its head. Found on the machine's lower half is called Slide Pad which provides the players an analogue control that can be considered as more useful and easy to use as compared to the analogue stub of the PSP. Due to the large size of the pad, it would be able to fit your thumb well. You will observe that its D-pad as well as the face buttons are exactly similar to that of the DSi, and is able to respond well and can easily be clicked. The buttons for Start as well as Select have already been joined by the latest, which is the Home button. The slot for the console's SD Card still remains and would make it possible for you to expand the unit's memory. However, it was not revealed by Nintendo the amount of internal memory that the system will have. Nintendo owns the E3 and there was a revelation of a very exciting piece of hardware for gaming that has been utilized. The 3D is indeed exceptional and this is only one of the remarkable features of this unit that would allow you to play one of a kind games. 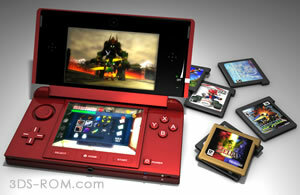 It was told by Nintendo that the 3DS is going to be released in March 2011 in Japan. It was suggested by rumors that it is going to be released all over the world before Christmas. Many people will surely hope for the latter's accuracy. Pokemon Black Version USA English and EUR, Final Fantasy: The 4 Heroes of Light, Kingdom Hearts Re: Coded, Okamiden, Lufia: Curse of the Sinistrals, Pokemon White Version (U) Rom English Patch, Golden Sun: Dark Dawn, FIFA Soccer 11, Super Scribblenauts, Sonic Colors.